Supreme Court To Decide Whether 2020 Census Will Include Citizenship Question The high court agreed to a speedy review of a lower court's ruling that stopped Trump administration plans to use the census to ask whether every person living in the country is a U.S. citizen. 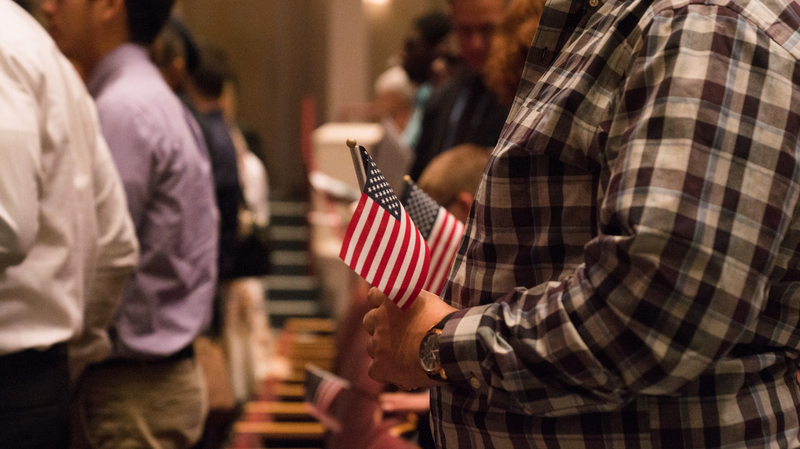 Newly sworn-in U.S. citizens rise from their seats during a 2018 naturalization ceremony in Alexandria, Va. The Supreme Court has agreed to decide whether the Trump administration can add a citizenship question to the 2020 census. The decision grants the administration's request for an immediate review of a lower court's ruling that stopped plans for the question. A hearing is expected to be held in April. The question asks, "Is this person a citizen of the United States?" The Trump administration is locked in a legal battle with dozens of states, cities and other groups that do not want the question to appear on forms for the constitutionally mandated head count of every person living in the U.S. The Census Bureau has not asked all households about U.S. citizenship status in close to 70 years, although a sample of households have encountered a citizenship question on a smaller Census Bureau survey now known as the American Community Survey. For the 1950 head count, census workers asked where members of all households were born. If people were born outside the U.S., census workers asked whether they were naturalized citizens of the U.S. Citing Census Bureau research, the groups suing argue that asking about citizenship status will depress census participation among households with noncitizens. That could lead to an undercount of immigrants and communities of color, which would have major implications for the way political power and federal funding are shared over the next decade. Pressure is mounting to resolve all of these disputes by June so that the printing of paper questionnaires for the census can proceed as scheduled. Population counts from the census determine how many congressional seats and Electoral College votes each state receives. They also guide the distribution of an estimated $880 billion a year in federal tax dollars to states and local communities for Medicare, schools and other public services. The Supreme Court's decision comes a month after U.S. District Judge Jesse Furman of New York ordered the administration to stop its plans to include the controversial question. Furman's decision for the two lead lawsuits based in Manhattan was the first major trial court ruling out of seven lawsuits over the Trump administration's decision to add the question to the census. The administration maintains that the Justice Department wants responses to the question to better enforce part of the Voting Rights Act. In his 277-page opinion, however, Furman concluded that was not the "real reason" Commerce Secretary Wilbur Ross, who oversees the Census Bureau, approved including the question on the census. The judge found Ross' decision to be "arbitrary and capricious," in part because adding the question is less effective and more expensive than an alternative method the Census Bureau recommended to Ross — compiling existing government records on citizenship. Furman also said that Ross made a "veritable smorgasbord of classic, clear-cut" violations of administrative law, including providing misleading statements about the citizenship question. Ross has said that the Justice Department "initiated" the request for the question. But court filings show that after discussing the question with Steve Bannon, the former White House chief strategist, and former Kansas Secretary of State Kris Kobach, Ross pressured his staff at the Commerce Department to get a formal request for the question from the Justice Department. A spokesperson for the Department of Justice, which is representing the administration in these lawsuits, said the department "looks forward to argument before the Supreme Court." "We are pleased that the Supreme Court has decided to hear this case defending the government's legal and reasonable decision to reinstate a citizenship question on the 2020 census," said Justice Department spokeswoman Kelly Laco in a written statement. "Adding a citizenship question to the census would cause incalculable damage to our democracy," said Dale Ho, one of the lead plaintiffs' attorneys at the ACLU, in a statement. "The evidence presented at trial exposed this was the Trump administration's plan from the get-go." "The District Court recognized these facts in ruling in favor of our challenge and we look forward to seeing the Trump Administration in court once again," said New York State Attorney General Letitia James, whose office represented some of the lead plaintiffs in district court under her predecessor. In an unusual move, the Trump administration's attorneys appealed Furman's ruling to the 2nd U.S. Circuit Court of Appeals before asking the Supreme Court to bypass the 2nd Circuit and take on reviewing the decision earlier. Besides the two lead lawsuits in New York, district judges are hearing citizenship question cases in California, Maryland and Washington, D.C.
Internal documents released as part of the lawsuits reveal that the Trump administration had prepared to defend adding a citizenship question in the country's highest court. "Since this issue will go to the Supreme Court we need to be diligent in preparing the administrative record," Commerce Department official Earl Comstock wrote in a 2017 email to Ross. "We should be very careful, about everything, whether or not it is likely to end up in the SC," Ross replied.